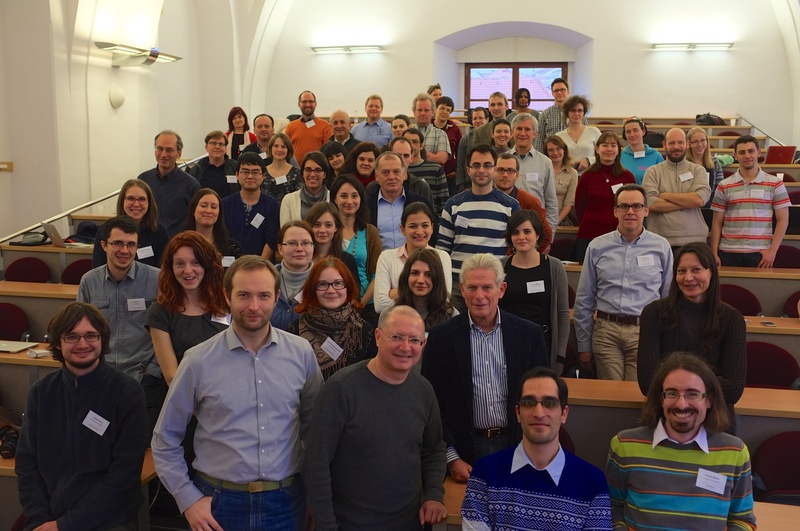 The Training School will be dedicated mainly (but not only) to Early-Stage Researchers. Conference venue is at Malostranské náměstí 25. There are locked door just after the entrance and the reception. They will be open on Monday and you will get the keytag at registration. See Access. You have to hand it back after the school, otherwise you have to pay 3.5 EUR for it. Registration and all sessions (except for three lab sessions) take place in room S3. It is on the third floor: go right from elevator/stairs to the end of the hall. You can use this schematic plan (floor numbers according to american practice: 1st = ground floor). Lab sessions take place in unix lab SU2. It is on the ground floor: turn left at the first oportunity after entering the building. You will get your login name and password at registration desk. You can use it during lab session, you can also log in remotely (machines u-pl1.ms.mff.cuni.cz to u-pl37.ms.mff.cuni.cz, port 22 or 322) or you can use any computer in lab SV1 on the ground floor -- just show your badge when entering. You have to sign in the attendance list every day. Certificate of attendance will be provided (only on demand). All interested trainees are required to fill in the registration form. Deadline was 20. November 2014. If the number of the registered candidates is higher than the capacity of the Training School, the PARSEME Steering Committee will select those who can be invited to participate (young researchers and PARSEME members have a priority). Most of them will also be entitled to reimbursement of their travel and stay (provided that they are affiliated in one of the PARSEME member countries). If you have been selected as entitled for reimbursement, you will receive a formal invitation via email (from noreply_at_cost_dot_eu). You should accept the invitation before travelling to Prague. After the training school, you should fill in the reimbursement form that will be available online via the e-COST system and submit electronically all relevant documents, as indicated in the reimbursement form. Wifi: There is an Eduroam access in the whole building (as well as other universities around the city and even train stations). Certificate of attendance will be provided if you ask for it. Emergency phone numbers: 112 (EU-wide equivalent of 911), direct emergency numbers (faster): Fire Dept. : 150, Medical EMS: 155, Police: 158, City police: 156. If everything else fails, call Jan Hajic at +420 607 209 212 (or 011 420 607 209 212 from a U.S. phone). The venue is not freely accessible. It will be open on Monday morning, and everyone will get a pre-programmed keytag for entry during the training school (keytags will be distributed at registration, 9:00-9:30 January 19, in front of room S3 where the programme takes place). This keytag has to be used for entering the building using either the main door (8am – 8pm) or the side door (24/7). NB: for those NOT arriving in time for the registration Monday morning before 9am, please go to the front desk (turn right just after the main entrance, small glass door) and ask them to let you in for "The PARSEME Training School". Then go to S3. If there is any problem, ask the front desk to call ÚFAL secretariat at ext. 4278, or if that does not help, use Jan Hajic's email and/or cellphone (see contacts above). Most talks will take place in S3 (third floor), except for Thursday and Friday lab sessions (three sessions together), which will take place in SU2 (ground floor, at the vending machines). Lunches: The building sports a cafeteria in the basement (Floor -1). On Monday through Thursday we will take lunches there, 12AM–1.30PM. Dinners: These are up to the individuals to organize. The building cafeteria we use for lunches is also open after 5pm for dinner. There are many places to eat out within walking distance, as expected in a very touristy area. Choose any hotel you like – some recommendations in the limit of your budget are below. You have to book it yourself (with the only exception of HAMU hotel). HAMU (AMU Hotel/AMU Pension) is located at Tržiště 18, 118 00 Prague 1, across from the U.S. Embassy. It is about a 4 minute walk from the entrance to the Venue. For those arriving by taxi from the Airport or elsewhere, show the taxi driver the address and say you are travelling to the "AMU Hotel". Once you are in the front of the hotel, enter the main door, climb a few steps and there is a front desk on your left, on top of the stairs. If there is any problem checking in, ask for Mr. Bartos. There are 15 double rooms. You can either pay 890 CZK (~32 EUR) for the whole room for single person. Or you can share it with a Parseme colleague for 410 CZK (~15 EUR) per person. An accommodation is without a breakfast, there is a kitchen on each floor, though. Wi-Fi is provided. There was a reservation form here. Hotel Kampa (Old Armoury) is about 12 minutes from the Venue. Single room for 43 EUR. Wi-Fi and breakfast included. You can also stay in apartments in Vlašská. This is past HAMU uphill, about 6-7 minute walk from the Venue. Two guests: 40-50 EUR/room, four guests: 50-70 EUR, six guests: 90 EUR. Not so nearby but cheap and known to be OK: Hotel Krystal. 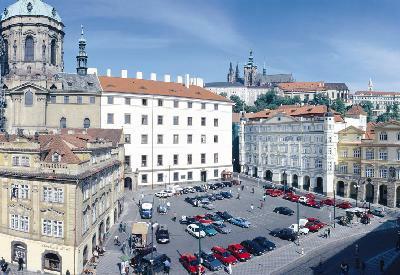 Participants can find suitable accommodation also on www.czechsite.com and www.prague-hostels.cz. a cab: take ONLY "AAA" or "111" yellow taxis. The fare should not go over CZK 600 (USD 30) to "Malostranské náměstí". Ask the driver about the cost beforehand. There is a stand inside Terminal 2, just after leaving customs. Taxi drivers should ALWAYS issue a signed receipt. They should accept CCs (ask at the stand and the driver! ), CZK and EUR (not a very favorable exchange rate), but not USD. public bus/metro/tram: take bus No. 119 (departure: Terminal 2; that's where most EU flights except UK land) direction "Dejvická". Get out at "Dejvická" (final stop). Then change for Metro line A (green line), go two stops to "Malostranská". Then, take tram No. 12 or 20 or 22 one stop to Malostranské náměstí (the tram goes to the right if you get out of Metro). Tickets can be bought (coins only) at a machine at the bus stop at the airport, in CZK, and cost 32 CZK (1.60 USD) one way, changes permitted but ticket has to be stamped in the first bus/metro/tram you enter. With a lot of luggage, the cab is probably the preferred way to go. Public transport is frequent, cheap and reliable and operates 5am-midnight, with some night trams running overnight. Please refer to http://www.dpp.cz/en for more information. 30 min. ticket is 24,- CZK (USD 1.20), 90 minute ticket is 32,- CZK (USD 1.60). Children 6-15 are half price, free if under 6 years of age. Transfers are allowed among regularly scheduled routes (bus/tram/metro) within the city limits and within the max. time bought. Tickets have to be stamped upon entry to the first car/bus. 1 day unlimited tickets are 110,- CZK (USD 5.50), passes are irrelevant since everyone stays in a walking distance. Senior/student fare is irrelevant too for non-EU citizens, but even then, it might take time to get the PIT/student card without which they cannot be used. You can find your connection here. The public transport is a recommended means of transportation in Prague. It is quite reliable and safe – safe to the extent as any Capital City may be, but certainly not safer. Beware of pickpockets! They are in action in the most frequented places, such as the Wenceslas Square (Václavské náměstí), the Main Railway Station (Hlavní nádraží) and on metro stations and metro trains in the city centre. Also, some tram lines have a bad reputation – No. 22 going through the centre. Always try not to be alone when using trams at night. Tickets have to be bought before boarding the metro/tram/bus, either at ticket machines (CZK coins only) at some tram stops and most metro stations, or at some newspaper stands. One such newspaper stands is at Malostranské náměstí (see the map referred to above), and a ticket machine is at the tram stop at Malostranské náměstí (direction Nový Smíchov Shopping Center/Újezd).